From Harlem to Havana celebrates artistic diversity, history, and the importance of keeping one’s cultural roots. 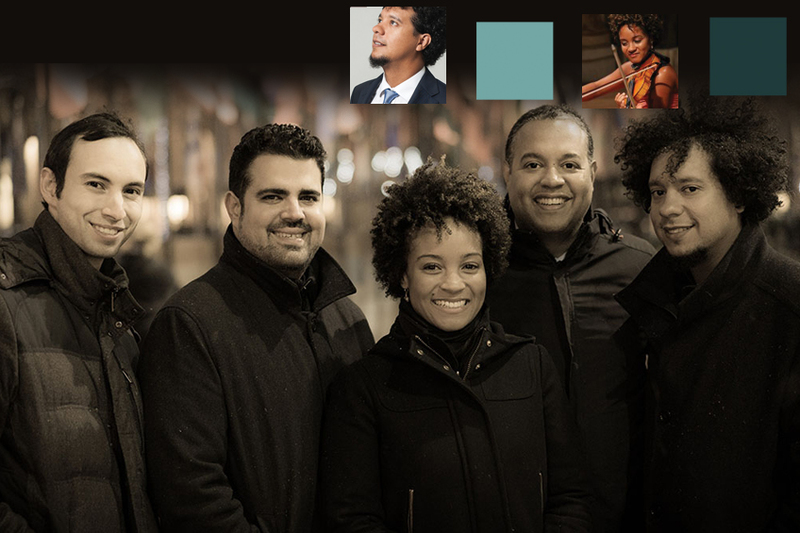 The performance marks a long-overdue family reunion between music prodigy brothers Ilmar Gavilán, Harlem String Quartet’s first violinist and a founding member, and Aldo Lopez-Gavilán. The brothers grew up in Havana and attended the prestigious Manuel Saumell Conservatory. When Ilmar’s studies took him to the United States, opportunities for the brothers to perform together became scarce. Now, with renewed diplomatic relations with Cuba, they are thrilled to be collaborating and performing together again on the same stage. The brothers discuss their lives as musicians, their influences, and their upcoming performances. Q: Let’s talk a little bit about your start with music and your roots in Cuba. Ilmar Gavilán: Cigars, sugarcane and salsa. I’m kidding, none of those three things happened in our case. Aldo Lopez-Gavilán: We grew up in a musical family. My grandfather was a clarinet player; my grandmother used to teach and sing in choirs; and they both wrote songs with their own original lyrics. Our parents were musicians. So we were surrounded by music and culture from the start of our lives. Did we have a choice? Having Ilmar already playing violin at a young age was also a big inspiration for me. We listened to all kinds of music at home and at school — more than classical music. That included traditional Cuban music, folk tunes with Afro-Cuban rhythms and lots of great American jazz. My grandfather was particularly fond of old school jazz. Q: Do you have a favorite memory of you and your family making music together? Aldo Lopez-Gavilán: When I was about four years old, I had a song in mind that I used to hum. My grandfather found some chords to accompany me on the guitar, and my grandmother helped craft the lyrics for my tune. I made up one of the Spanish words — my own invention! This became our family project and song. Indeed, we even played it together on a television show. Q: Would you say that’s your first composition? Aldo Lopez-Gavilán: Well, maybe! One of the first ones for sure. Q: Aldo, how did you make the transition from performance to composition in your career? Aldo Lopez-Gavilán: It was very natural for me to compose — to invent my own melodies and my own ideas. Ilmar and I started going to music school in Cuba when we were seven years old. We learned traditional classical academy repertoire from Western Europe such as Mozart and Bach as well as music history. My piano playing was developing, but I had a strong desire to write my own melodies. As I was become more proficient as a performer, my compositional skills grew alongside it. Ilmar used to say that if I was learning a piece by Chopin, then I would compose in the style of Chopin. Q: Who would you say are your biggest influences? Aldo Lopez-Gavilán: It’s a big list. I would say the closest to my interests is early 20th-century classical music by composers such as Ravel, Stravinsky, Debussy, Copland and Prokofiev. In jazz, I find myself attracted to the styles of Keith Jarrett, Chick Corea, John Scofield and Mark O’Connor. All these guys have a big influence in my music because I really adore and respect them a lot. Q: Starting the second half of your program with Epílogo seems unusual. What’s the reasoning here? Ilmar Gavilán: Epílogo has the content of an epilogue, and it should really be at the end of the whole story. It’s a good title for the content. We put it at the beginning because musically it fits better with all the other works. Epílogo is one of Aldo’s most “classical” compositions, yet synthesized through the lens of a Cuban native. The works has become very popular outside of Cuba. Chanel, the fashion empire, requested Aldo to perform it during their Havana parade fashion show, which was broadcasted all over the world. Violinist Joshua Bell requested the work to be performed at Lincoln Center, which was aired by PBS. Q: Your program contains a wide gamut of music. What’s your approach in putting a concert together? Ilmar Gavilán: We like to program concerts that will attract a diverse group of people. We see jazz as a way to attract younger people, but we also see a way to present jazz to more established audiences that are used to chamber music. Our jazz is presented at a very polished level in new versions of standards and favorites. Many will know Duke Ellington’s Take the A Train, but most likely they haven’t heard it played by a string quartet. We take it as an opportunity not only to reach new audiences by playing things that are more accessible, but also to reach regular audiences with different arrangements that they probably haven’t heard. That’s the general attitude — to be inclusive but not in a populist kind of way. We do it in a way that everybody might find something they can be attracted to. Q: Your concerts have an unexpected mixed of genres. How do you program a concert? Ilmar Gavilán: Sometimes we program chronologically. But if the overall feel of the selections is better arranged differently, we don’t break a sweat thinking about changing things up. Suggesting that somehow the non-classical is the lesser type of music is a very easy thing to do when you put it as an encore like a dessert. We do not want to come across that way. We respect every musical genre equally. Q: You two have a really congenial relationship. What is it like as brothers to make music together? Ilmar Gavilán: I think the fact that we didn’t live together makes us sometimes love each other even more. So when we get to play together, it feels like a big party. There’s no time for anything other than celebration. Even though we can work very hard and be very demanding of one another, there’s still underlying joy even if the music is not festive.